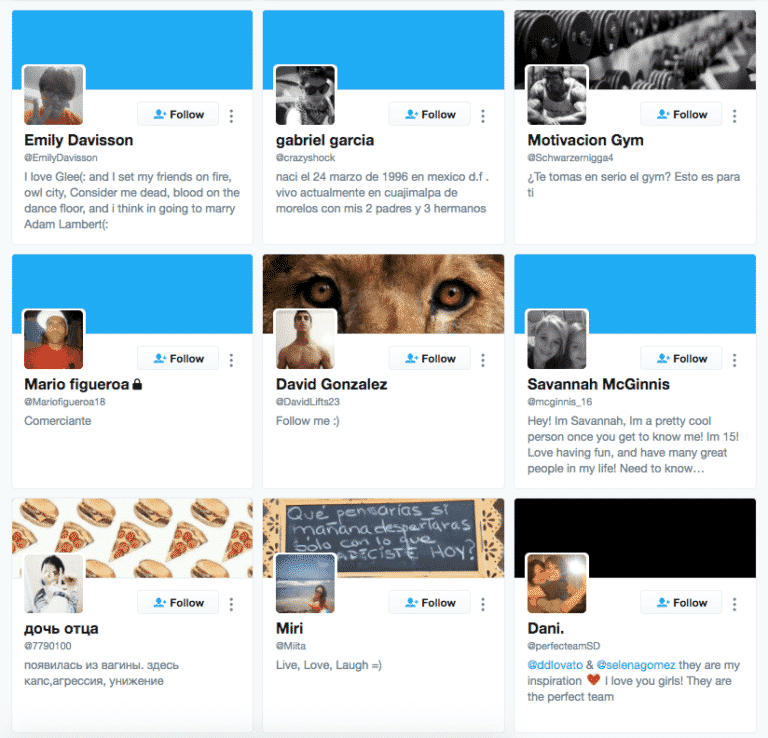 Buy1000Followers isn’t the best looking site, and you may be confused by some of the information you read. There isn’t much to be found about the quality of the service, but there are good refund and replacement policies. Overall, the followers we ordered did arrive on time, and they’re good quality for the price. Buy1000Followers has been around at least since 2013. They offer social media boosting services for Twitter, Instagram, Facebook, and YouTube. Buy1000Followers offers both untargeted and targeted followers. Targeted followers will cost a bit more, and your options are: USA, Canadian, UK, Arabic, Spanish, Indian. Buy1000Followers has a basic, straightforward Terms of Service. They offer a 30-Day 100% Money-Back Guarantee, no questions asked. If the order is not delivered as promised, you can get your money back at any time. They offer a Lifetime Replacement Warranty. Followers should be refilled automatically if any drop. If followers are not refilled, contact customer support. Before ordering, we sent in a few questions about their Twitter follower service. We didn’t get a reply back, unfortunately. 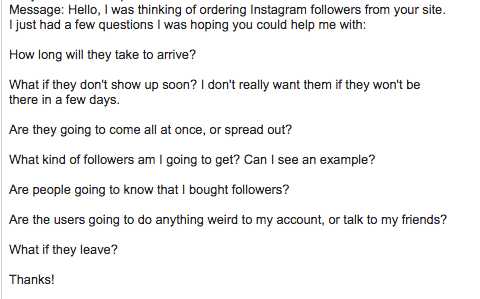 We sent another set of questions later on for a different test, of Instagram followers. We did get a reply to this one. As you can see below, the reply was pretty brief. It also didn’t address one of our most important questions, about the quality of followers we would get. See our questions and the reply yourself below. While the website isn’t the prettiest and it’s a bit confusing, the followers did arrive on time. They’re of decent quality – not the best, but definitely not the worst either. There is no information to be found on the site regarding how long your order will take to deliver. However, in an email, we learned that delivery time is 24 hours, and followers will be delivered at a gradual pace, not all at once. We received some pretty good quality followers from Buy1000Followers.co. They are not the most high quality we’ve seen, but they’re definitely not the worst from those we’ve tested. By retention, we mean how long a followers stays following you. Some providers offer followers that will leave you soon after you buy them, which is basically a waste of money. While many providers offer a retention guarantee, you don’t want to have to use it. As you can see, we have lost some followers since our order was completed. Buy1000Followers.co doesn’t have the nicest website, and you may be confused by what you read. There isn’t enough information about the service, including the quality of followers you’ll get. However, the followers we received came on time, and they are of decent quality. There weren’t any eggheads or NSFW followers. They also have solid protections in place for customers: a 30-day money back guarantee and a lifetime replacement guarantee for any followers that are lost. If you’re looking for average-quality fake followers for a good price, Buy1000Followers will probably work for you. If you want to spend a bit more and get higher-quality followers with great customer protections, check our Top Providers list now. The twitter followers i ordered were delivered to me on the same day. A majority of the followers had complete bios and pictures. Some of the followers even engaged my account. It is a great service. Made the purchase and nothing happened. Contact the vendor a few days later and no response. Now it's almost 15 days since purchase and my account has not changed and they won't return my money. The customer service is very helpful and takes all sentiments shared with seriousness and delivers. Bought a few thousand Twitter followers, then as Twitter did a clean up on fake followers, I got suspended! Biutght 1k on Twitter 9 days ago. Responded to my first email saying they have raised a dispute and the team will get back to me in 48 hours... 9 days later nobody has got back to me, no new followers and also not responding to me now. Not happy at all. Choosing a source for Twitter followers can be quite confusing. I chose them and I am satisfied with the results. 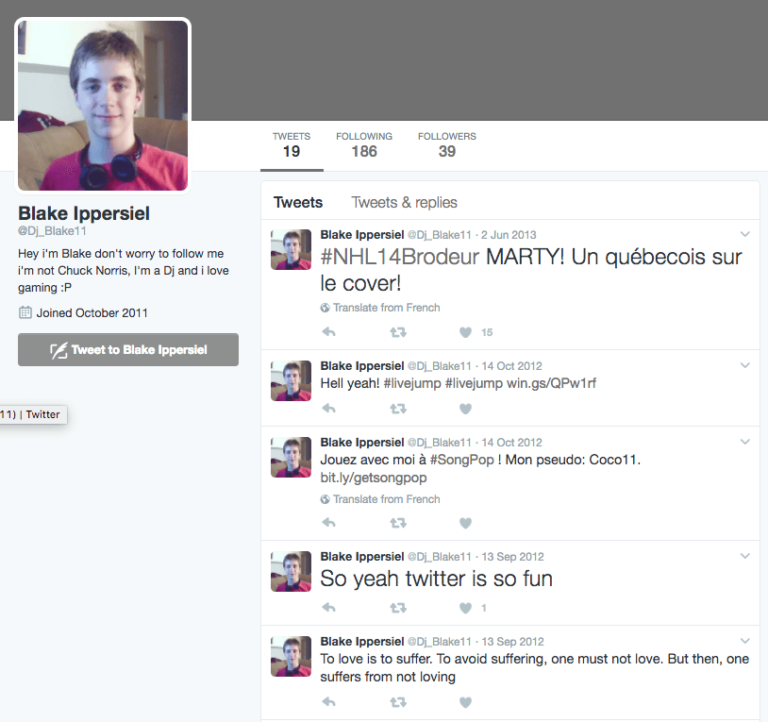 For $6 per 1k Twitter followers, whose quality is unquestionable, the site clearly beats all others, hands down. Got 3k followers for what I would call just a few bucks compared with what other players in the follower sale industry offer. Their affordability is incomparable and they did as they said. These guys are exactly what value for your money means. I love the fact that their customer service is really helpful. They delivered my order of 2000 followers within 2 days. I will definitely use them again. I began by checking through their site and the reviews. I was however still apprehensive and decided to try buying a small package of 1k followers. They delivered and I looked at all the indicators and was assured that it was good business. I then ordered 10k more and have no regrets.